Raspberry Pi is a credit card sized, single board computer that plugs into a TV/monitor and a keyboard. It is powered by Linux. 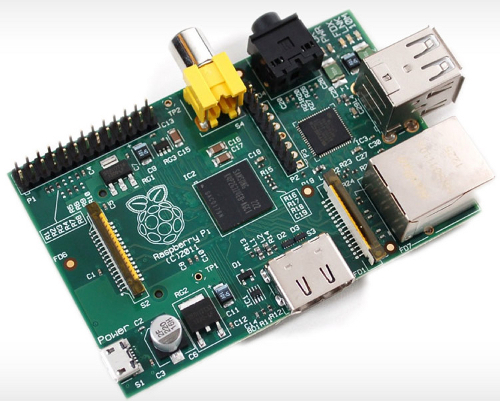 Raspberry Pi has become quite popular the world over for its low cost, hackability, and innovation. For the price of $25 to $35, depending upon the model you choose, you get a powerful system with high-performance graphics, basic input-output capabilities, HDMI video output with 1080p full HD support, and much more. And it is quite small and is lighter than your average cell phone - weighs only 45 gms. The graphics capabilities of a Raspberry Pi is equivalent to an XBox 1 and the real world performance is similar to a 300MHz Pentium 2.However, you can easily overclock it to run at 800MHz. The brain child of the Raspberry Pi is a not-for-profit charity named Raspberry Pi Foundation which aims to further the cause of computing in education by offering computing devices that are hackable, at a low cost, to the less than priviledged people around the world. The Raspberry Pi comes in two models (Model A and Model B). Model A has only 256 MB RAM, a single USB port, and no Ethernet. Where as, Model B has twice the memory of Model A (512 MB RAM), 2 USB ports, and an Ethernet port all other features remaining the same. Raspberry Pi foundation is not directly selling the device. However, it has got tieups with Farnell and R S Components who are electronics distributors who ship world wide. In India, Protocentral is selling a Raspberry Pi kit for Rs 5999 ~ $100 which is more than the $35 tag, however it gives you all the components necessary to get hacking with the Pi and program, debug and connect it to external devices. The MagPi - An online magazine dedicated to the Raspberry Pi.